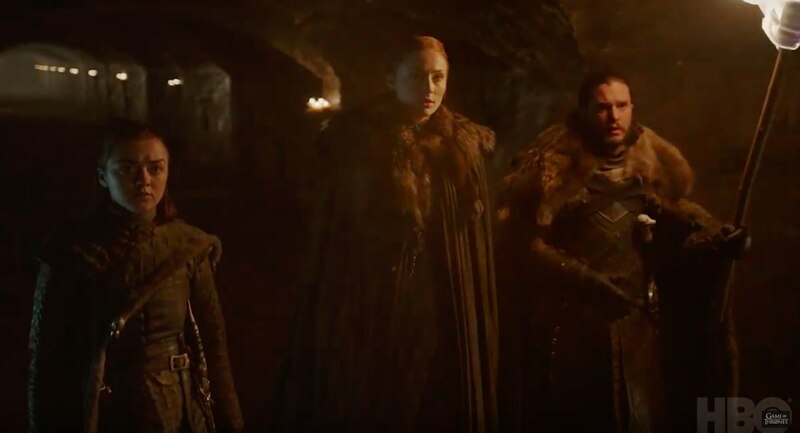 The trailer finds Jon, Sansa and Arya stalking through their family home’s underground passages, walking past statues of Ned and Catelyn Stark as prophetic lines of dialogue from past seasons echo. Notably, we hear Ned telling Jon: “You are a Stark – you might not have my name, but you have my blood.” Considering we now know Jon’s true identity is Aegon Targaryen, it remains to be seen whether Ned’s quote will ring true. Is Jon a Stark at heart, despite his alternative lineage? And how will that affect his relationship and alliance with Daenerys, now known to be his aunt? Most heartening is the final shot, as a hard frost creeps towards the Stark trio – and they draw swords together to fight the encroaching winter.